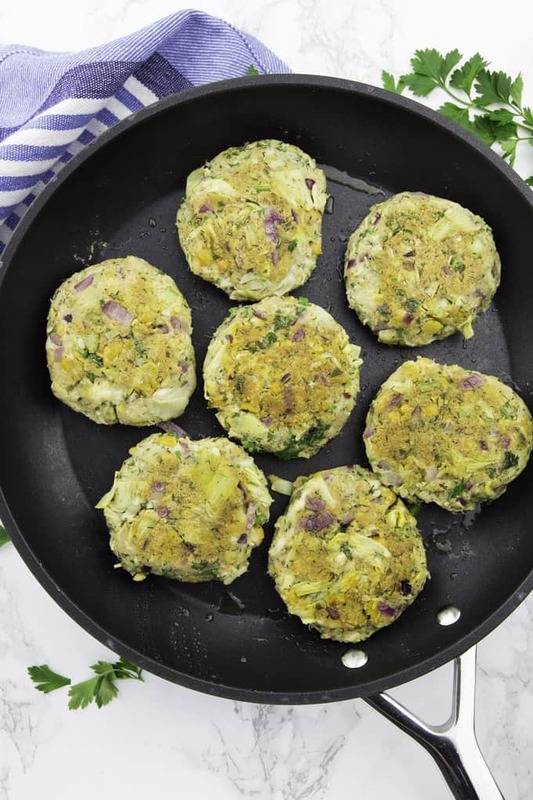 If you used to like fish and crab cakes, you will love these vegan crab cakes with chickpeas and artichokes. They’re super delicious and very easy to make. 20 minutes is all you need! And they make such a great vegan fish alternative! I served them with homemade vegan remoulade sauce with lots of fresh dill and lemon juice. We enjoyed them with a green salad but they’re also great with a potato salad or even on a sandwich. So yummy! Will A Vegan Eat Fish? It might seem surprising to some people but I’ve heard this question sooo many times. Some people also ask “can vegans eat fish?” to which I usually answer “sure, we can, but we decide not to”. 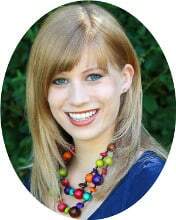 Vegans avoid all kinds of animal-derived foods as well as byproducts. So vegans don’t eat fish, seafood, meats, dairy, and eggs. But fortunately for those who used to like fish, there are some great vegan fish alternatives or you can make your own vegan fish at home. 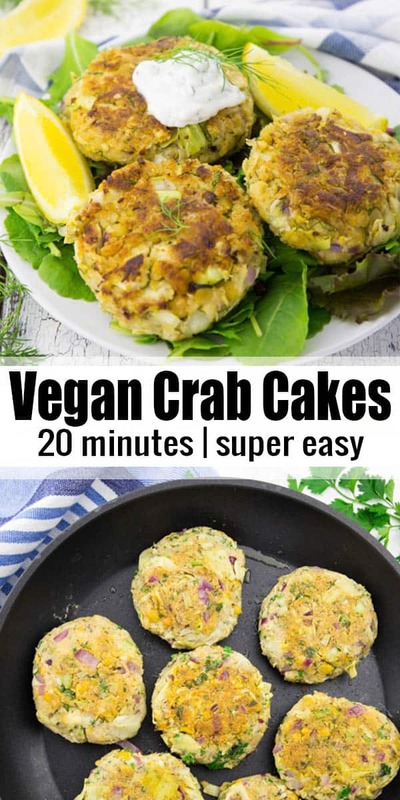 These vegan crab cakes are a great example! The hardest part about making vegan fish is achieving the “fish-like” taste. You can, however, get your vegan fish to taste like the ocean by adding seaweed. For example wakame flakes really do the trick. I usually add them to my vegan tuna salad that is made of mashed chickpeas. It’s one of my favorite salads to put on a sandwich. Of course nobody would think it’s a real tuna salad (the texture is obviously different) but so many people already told me that it really does taste like fish. You could even wrap firm tofu in seaweed sheets (such as nori) and coat it with breadcrumbs for some sort of vegan fish and chips. Or you could use oyster mushrooms instead of scallops or what about carrot lox? Sounds crazy, but this really is a thing! 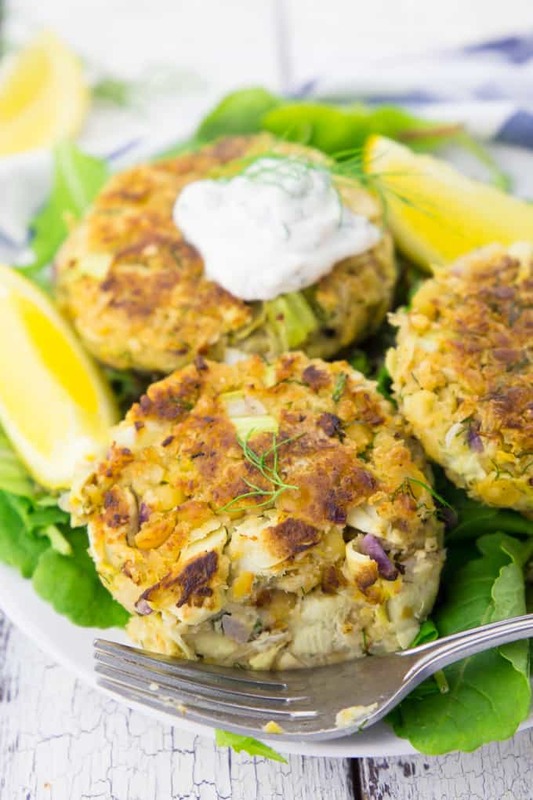 You can find all of the ingredients for these vegan crab cakes in any regular supermarket. 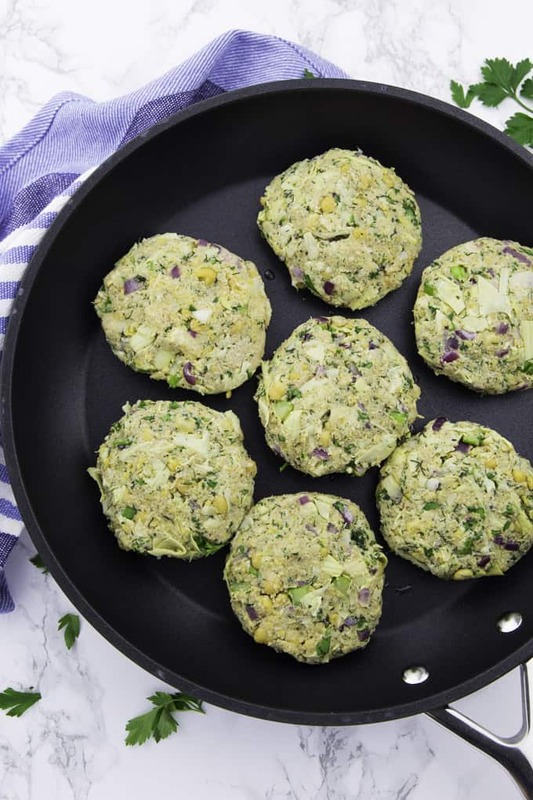 You can use different vegetables and legumes to make vegan crab cakes. 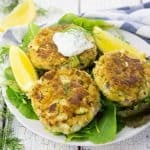 My vegan crab cakes are ready in only 20 minutes! STEP 1: In a pan, heat some oil and sauté the chopped onion for 2 minutes. Then add the garlic and cook for another minute. Set aside. STEP 2: Then add the garlic and cook for another minute. Set aside. STEP 3: Mash the chickpeas in a large bowl with a fork. Leave them partially intact for more texture. STEP 4: Add the remaining ingredients (including the cooked onion and the garlic) and season with salt and pepper. STEP 5: Form eight vegan crab cakes. STEP 6: Heat some oil in a large pan and cook them on each side on medium heat for about 2-3 minutes or until they’re lightly browned. 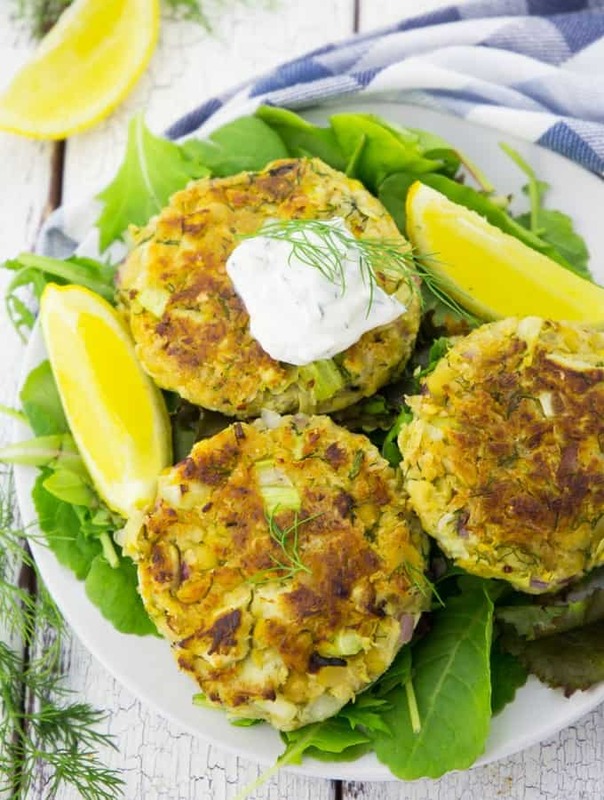 STEP 7: Serve the vegan crab cakes with a green salad and top them off with vegan mayonnaise or remoulade. Either use store-bought vegan mayonnaise or make your own. I decided to use a base of chickpeas and artichokes for my vegan fish cakes. I also tried vegan crab cakes with hearts of palms, but I preferred the vegan crab cakes with artichokes. The artichokes make an amazing texture! However, you could also replace the artichokes with hearts of palms. To make the vegan fish cakes hold together, I added panko bread crumbs. If you can’t find them, you can also use regular or whole wheat bread crumbs instead. The fresh herbs (dill and parsley) are important for the taste. Don’t leave them out! I served the vegan crab cakes on a bed of green salad with vegan remoulade and lemon slices. For the remoulade I combined vegan mayonnaise with salt, pepper, fresh lemon juice, and dill. You could also add dill pickles if you like. 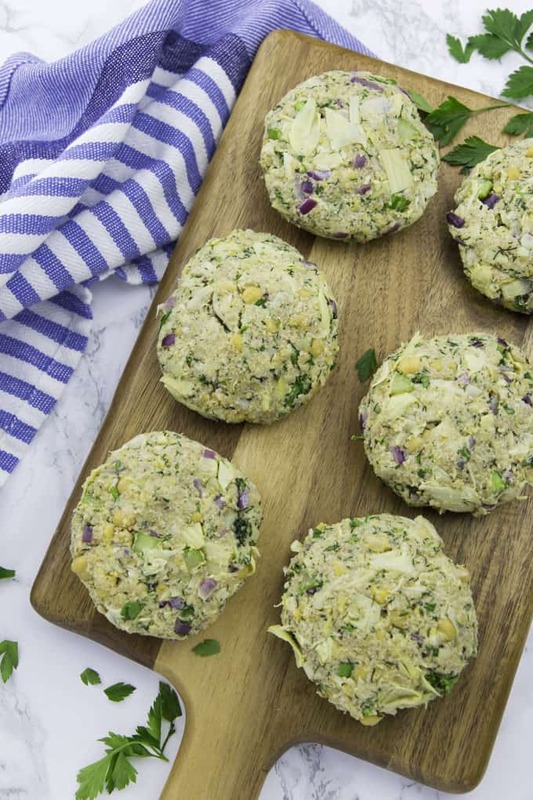 I hope you like this vegan crab cakes as much as we do around here. 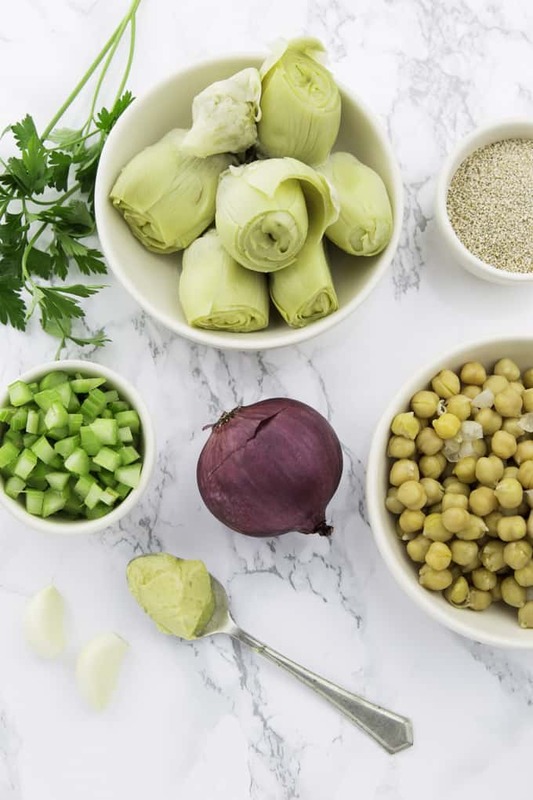 These vegan crab cakes with chickpeas and artichokes are super delicious and very easy to make. They make such a great vegan fish alternative! In a pan, heat some oil and sauté the chopped onion for 2 minutes. Then add the garlic and cook for another minute. Set aside. 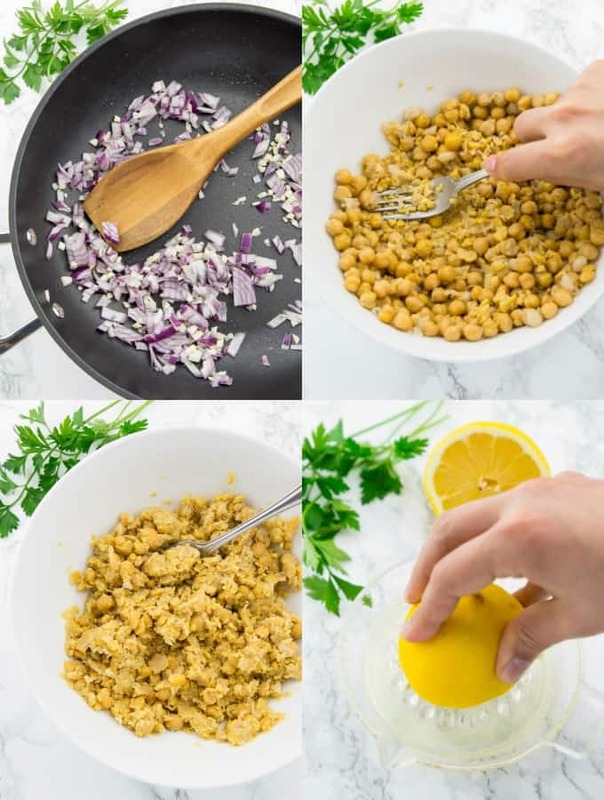 Mash the chickpeas in a large bowl with a fork. Leave them partially intact for more texture. Add the remaining ingredients (including the cooked onion and the garlic) and season with salt and pepper. Form eight vegan crab cakes. Heat some oil in a large pan and cook them on each side on medium heat for about 2-3 minutes or until they're lightly browned. I served them on a bed of green salad with vegan remoulade and lemon slices. 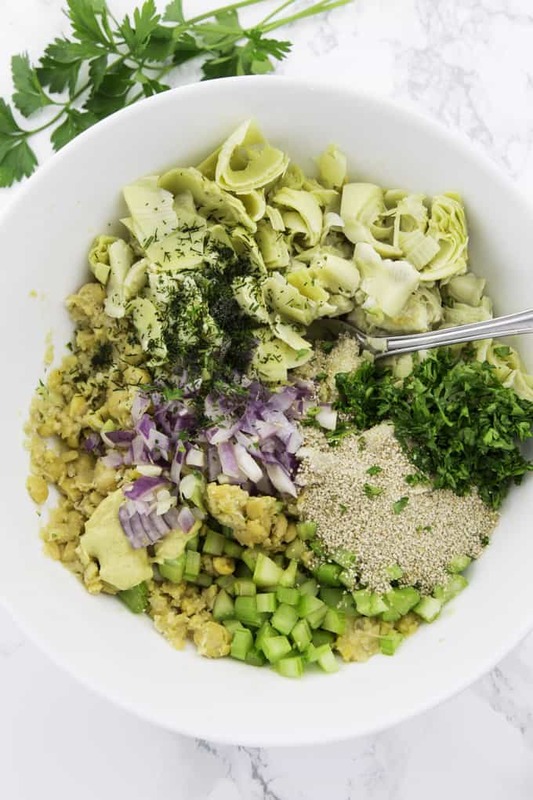 For the remoulade I whisked together vegan mayonnaise with chopped dill, fresh lemon juice and seasoned it with salt and pepper. To make the vegan fish cakes hold together, I added panko bread crumbs. If you can't find them, you can also use regular or whole wheat bread crumbs instead. The fresh herbs (dill and parsley) are important for the taste. Don't leave them out! These were really amazing! Thank you so much for sharing. I absolutely loved this recipe! It yielded 8 large cakes; thought I’d eat them over a few days but they were gone in two. The artichoke really does give it an amazing texture. I didn’t have panko so I used regular breadcrumbs and they turned out just fine. I also baked them instead; 10-15 min on each side at 375 degrees. They did lack a certain “fishy” taste, so I’ll be adding seaweed flakes next time. Will be making this again in the future! Outstanding! Taste is so close to the real thing I didn’t miss the crab meat at all! Thank you!